Family Events Along the Holiday Road! It seems the holiday season is getting longer and longer every year. The season used to officially begin after Thanksgiving, but these days, the Christmas decorations are out before Halloween in many stores. Whether or not you approve, the good news is, with a longer season, there is more time to spend with your family creating holiday memories and doing amazing things together. That’s part of the magic of Christmas for our family. My husband, two children, and I have our own traditions in our hometown, but we also like to take a weekend or two over the holidays to get away as a family, traveling to take in the sights and sounds of other towns in Virginia and beyond. There is plenty of holiday fun to be had in all directions, whether you and your brood want to head out for a day trip or an overnight stay. We have season passes to Busch Gardens Christmas Town and Colonial Williamsburg. 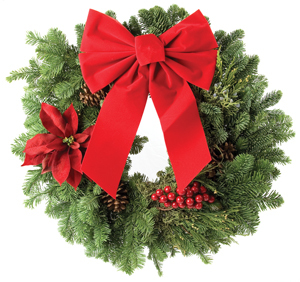 We love to frequent both during the holiday season, even if it’s simply to stroll along Duke of Gloucester Street in Williamsburg to admire the holiday décor, particularly the uniquely designed wreaths with fresh fruit hanging on the doors of the historic buildings. 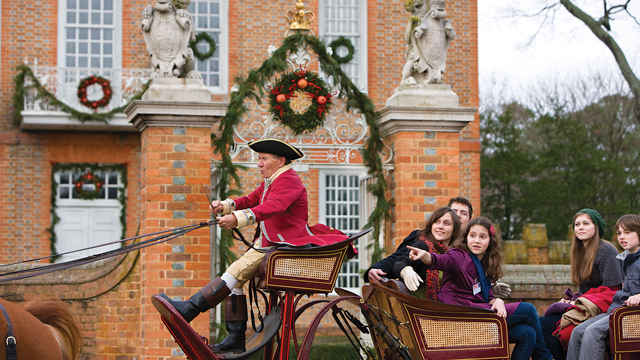 Colonial Williamsburg rings in the holiday season with fireworks during its renowned Grand Illumination, and has programs throughout November and December to celebrate the holidays, including story-telling, arts and crafts, musical performances and carolers, special dinners, and other events. My kids, though, get a thrill ice skating outside on Duke of Gloucester Street in the crisp air. Busch Gardens Christmas Town is a seasonal delight for the whole family – with holiday activities and shows for all ages. Meanwhile, families can also head over to Busch Gardens Christmas Town, and soak up the holiday atmosphere there while enjoying some rides, weather permitting. Be sure to hop on the sky ride, the train, or Mäch Tower just as the sun goes down and the twinkling holiday lights click on – it’s a breathtaking view! The park shines brightly with eight million lights, one of the largest displays in North America. At Christmas Town, families also take in holiday-themed concerts and shows, including the popular Scrooge No More, based on Charles Dickens’ A Christmas Carol, and the full-scale, musical ice skating show, ’Twas That Night, based on the poem, A Visit from St. Nicholas. World champion and Olympic silver medalist Elvis Stojko headlines that show at the Royal Palace Theatre. The Christmas parade in Williamsburg is lovely, but we opt for a unique spin on the traditional parade in nearby Yorktown, where we enjoy the festively decorated boats during the annual boat parade. We sit on the beach and watch the boats sail by with their lights and Christmas music while drinking free hot chocolate. Next door in Newport News, you’ll find the Celebration In Lights, a two-mile drive-through holiday lights show. On one of those rare 80-degree December days a few years ago (which seem to be less rare anymore), our family made a trip to the Outer Banks in North Carolina to see Winter Lights at the Elizabethan Gardens on Roanoke Island. We adored the walk-through light exhibit, especially the sparkling gingerbread men and gingerbread houses, gifts, toys, and treats, and other festive sights. Santa Claus was there handing out candy canes and taking Christmas list requests and posing for photos, and then the four of us gobbled up s’mores by a bonfire while watching Frosty the Snowman on a large movie projector screen. 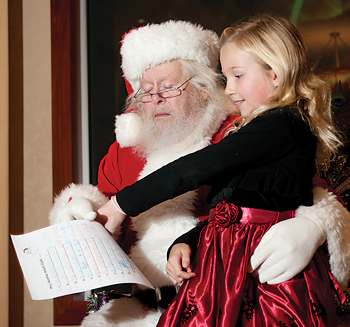 The garden has other special programs throughout the holiday season, including a dinner with Santa Claus. 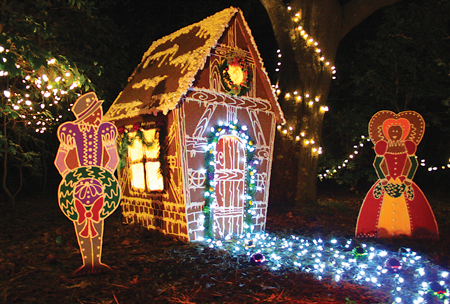 Your family will treasure the festive displays in the walk-through light exhibit at the Elizabethan Gardens on Roanoke Island. Families can also check out the holiday lights along the sand dunes at Jockey’s Ridge State Park in Kitty Hawk, and there are Christmas parades and tree lighting ceremonies all up and down the Outer Banks from Corolla to Hatteras. Although many families can’t fathom planning a beach getaway for November or December, it can be even more memorable for the kids to see the ocean during this time of year. A New Year’s tradition for our family is to book a Virginia Beach oceanfront hotel room overlooking the McDonald’s Holiday Lights at the Beach. The 3-mile drive along the boardwalk (the only time of year you can actually drive on the Virginia Beach boardwalk) features nautical-themed holiday lights including seashells, fish, and jumping dolphins, as well as displays highlighting the themes of the “Twelve Days of Christmas,” one of my family’s all-time favorite Christmas songs. 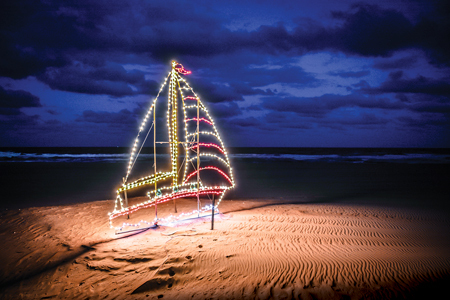 Virginia Beach lets visitors drive along a 3-mile stretch of the boardwalk to take in its nautical-themed light exhibit. Nature provides a stunning backdrop. Also along the oceanfront, you’ll find Santa’s Seaside Village with a walk-through exhibit of animated scenes, carolers, carnival rides, a petting zoo, pony rides, and other family entertainment. You can also check out a scuba Santa swimming in the tanks at the Virginia Aquarium and Marine Science Center on select weekends. The Norfolk Botanical Garden also has a drive-through holiday exhibit with dazzling floral lights featuring the four seasons. Back by popular demand, the Million Bulb Walk on select dates allows visitors to stroll through the gardens taking in the spectacular show. Families can also take a Polar Express Tram Ride around the garden. Last year, our family also went to the Winter Wonderland at the Portsmouth Art and Cultural Center. The kids loved the animated displays of the elves and reindeer in Santa’s workshop and all the sweets in Candy Land. They had a blast participating in a scavenger hunt and an ornament-making craft. Winter Wonderland also has face-painting, musical performances, and carriage rides. The four of us are routine visitors to Washington, DC, and know the National Zoo and sites along the mall like the backs of our hands. This Christmas, consider making the trek to Washington with your family to check out the National Christmas Tree, our area’s answer to the Rockefeller Christmas Tree. Afterward, head over to the National Zoo to say hello to the animals while enjoying the holiday lights extravaganza, Zoo Lights. The small mammal house, great ape house, reptile center, orangutan exhibit, and the kids’ farm are open every night during the event. Does that sound like too much walking? Hop on the train instead and take in the dazzling view on wheels. Little ones will also want to take a spin on the carousel. Zoo Lights at the National Zoo features a variety of special displays for families. Plus, many of the animal habitats get the holiday treatment (inset). ICE! at the Gaylord is another kid-pleasing attraction. Another one of our favorite attractions in DC is the United States Botanic Garden. This year, see a holiday show here called Season’s Greenings in honor of the centennial of the National Park Service and the fiftieth anniversary of the National Historic Preservation Act. 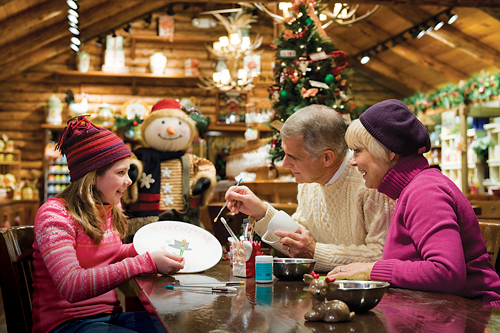 In the conservatory, you’ll find an enormous indoor Christmas tree decked out with ornaments from the national parks. Families also get a holiday kick out of the model train show with locomotives that chug along through plant-based replicas of famous American sites, including the Grand Canyon, the Gateway Arch, Mount Vernon, the Statue of Liberty, and more. Stay a while and check out blooms of exotic orchids, various poinsettias, and other plants and flowers. The garden also has live seasonal music performances on select Tuesday and Thursday evenings throughout the season. Also plan to visit the Gaylord National Resort and Convention Center in National Harbor. Its family-pleasing holiday attraction, ICE!, is back. 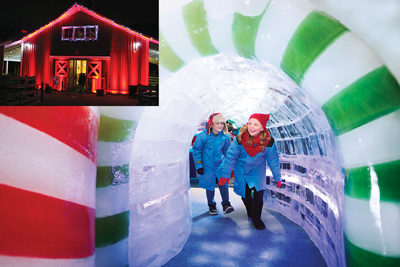 You’ll feel as though you are at the actual North Pole during the self-guided walk-through tour of the exhibit, which is kept at a mere nine degrees. ICE! features more than two million pounds of hand-carved ice sculptures commemorating holiday traditions from around the world. You’ll find stunning frozen scenes from Santa’s workshop and sleigh, as well as a gorgeous nativity scene many families will cherish. ICE! also has five ice slides, a live carve zone (The Frostbite Factory), and a magical indoor snowfall. The National Harbor has restaurants that cater to any palate, as well as a carousel, ferris wheel, kids’ climbing area, and plenty of stores to wrap up your holiday shopping. Fredericksburg kicks off its holiday celebrations mid-November with an open-house weekend downtown, replete with strolling entertainment, visits with St. Nick, refreshments, contests, and decorative storefronts showcasing a Window Wonderland theme. Young and old alike will enjoy the children’s tree lighting ceremony at Hurkamp Park. The event includes holiday crafts, hot chocolate and other treats, and children’s activities. Santa, of course, will drop by to read everyone’s favorite holiday tale, ’Twas the Night Before Christmas. 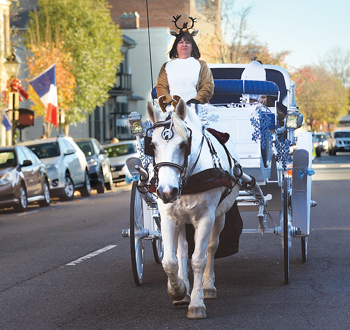 Enjoy a Jingle Bell ride through the streets of historic Fredericksburg. You can also catch a glimpse of beautiful historic holiday scenery with the Historic Fredericksburg Foundation’s Candlelight Tour, which this year takes you into the homes in the Winchester/Lewis Street neighborhood. Or, get into the spirit and splurge on a Jingle Bell ride, a horse-drawn carriage ride through the historic Fredericksburg area. Gari Melchers House and Studio at Belmont is worth the drive on 95 North. A renowned American artist of the early twentieth century, Melcher’s home is a National Historic Landmark. In late November, you can enjoy the estate decorated for the holidays in the spirit and style of the Melchers. It’s a glorious showcase featuring imaginative decorations and vignettes that interpret life at the Melchers’ cherished Falmouth country retreat. All exterior decorations are provided courtesy of a local garden club. We visited the Biltmore Estate – the famous home of George Vanderbilt – in Asheville, North Carolina, over the summer, and the sight is one to behold, with breathtaking views of the property and grounds. The holiday season at the Biltmore is just as spectacular, featuring special family events and activities that are definitely worth the trip and at least one night’s stay. 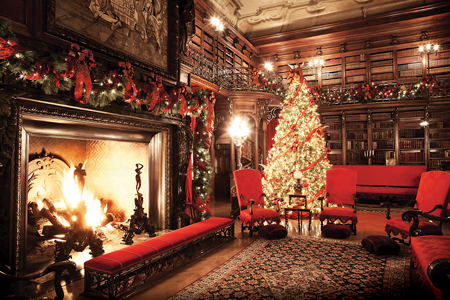 One of the most prominent remaining examples of the Gilded Age and the largest privately owned house in the United States, the 250-room home (including thirty-five bedrooms and forty-three bathrooms) has four acres of floor space, which is beautifully appointed with more than seventy hand-decorated Christmas trees. The tallest of these is thirty-five feet and stands in the banquet hall. More than 1,000 poinsettias as well as wreaths, garlands, and other festive illuminations and decorations await you. Elegantly appointed for the holiday season, The Biltmore Estate in Asheville, North Carolina, is the largest privately owned home in the United States. Closer to home, over Thanksgiving weekend, our family plans to visit the Science Museum of Virginia for the model train show. We also like outdoor ice skating (at West Broad Village in Short Pump and Stony Point Fashion Park this year), and strolling the grounds at Lewis Ginter Botanical Garden during the Dominion GardenFest of Lights. We love how they change the theme each year. Trying to find where they’ve hidden the peacock in the garden is one of my kids’ favorite activities. I keep saying one of these years, we will make it to brunch with Santa at Lewis Ginter. These wildly popular gatherings are already sold out. Also landing in the unlucky-for-us, sold-out category are the Santa train rides originating out of the Old Dominion Chapter National Railway Historic Society. The big guy visits with children during the 45-minute train trip. My kids are close to aging out of these kinds of things, so I really should look into both of these for next year, especially considering how quickly they book solid. Meanwhile, our neighbors who visited Legendary Santa as children are now taking their own kids to see him. He’s celebrating his eightieth anniversary at the Children’s Museum of Richmond. And, if you’re a big holiday lights fan, there’s always the Tacky Lights Tour. For a top ten list of Richmond-area holiday traditions and family events, check out RFMonline.com and read Inside Christmas. Brandy Centolanza is a freelance writer and mother of two. She writes about family travel opportunities and lifestyle.